See below for vision statement examples or create your own by downloading our free vision statement spreadsheet, see below sign up form. Vision describes a mental picture of what lies at the end of a road never traveled before. Business vision statement examples articulates the future status of the business, (after the journey), usually in terms of products, services, customers, market share, desired financial state, recognition, perception, etc. One should exist at the corporate level reflecting the Company’s Vision. Each down-the-line reporting organization should create their own which dovetails into the corporate version. Vision statement examples describe people and organizations not as they are, but as they desire to become. Leaders must know their path (their mission) and where it leads (their vision). With both clear mission and vision statements, your company sees day-to-day issues and challenges from a higher level – the big picture. The tasks of setting goals and priorities, planning, and execution aligns with the mission of the organization, and its desired future. A solid vision, documented as the Vision Statement, creates commitment and understanding. It enables the team to focus on the future. It enables others who read it to understand how the top of the organization visualizes the future. It should challenge and inspire the team to achieve its mission. Vision statement examples raise the expectations of the business. It creates a gap between where the business current status and where management wants the business to go. Then all business decisions and activities would/should focuses on closing the gap. Initially, it is a dream that with the right plan, personnel, commitment, and follow-thru can come to fruition. Effective leaders not only have a vision but also invest time selling their vision to gain buy-in. With a clear vision of a potential reality that they want to create, they communicate that vision to people whose resources they need in order to bring the vision to fruition. They inspire and motivate their constituents to willingly contribute their resources to enable the realization of the vision. These attributes apply to almost every business leadership role. Whether it’s a customer, a business associate, or an employee a leader needs to communicate a vision to sell, to inspire, to motivate. Even seasoned business owners can get so caught up in daily operations that they never find the time to deal with business planning issues and soon things become out of control. As a leader, it’s critical that you establish the vision, communicate the vision, inspire constituents, take decisive and direct action as appropriate, and be responsible for the outcome. Leaders must be proactive rather than reactive. Vision Statement examples forms part one of a two-part description of the overall business intent. The Vision Statement describes the future: where the business is going or where management wants it to go. While the Mission Statement, part two, describes today: why the business exists today and/or how management pursues the vision of the future. Together they provide direction for the business by focusing attention on doing things day-to-day to accomplish the mission, while taking steps to pursue the vision of the future – the long-term business intent. Note: From a chronological standpoint, one usually creates the Mission Statement first - out of need. The company formulates The Vision Statement after the business progresses to a viable and profitable point. However, from a business planning or Business Model perspective, list the Vision Statement first. The words that compose the Vision Statement should be carefully thought out and weighed, so that the statement itself isn’t too bland and boring. Make it heartfelt enough to excite and inspire those who read it to take action. The words should also reflect the values the organization actually lives rather than those it believes it ought to live by. 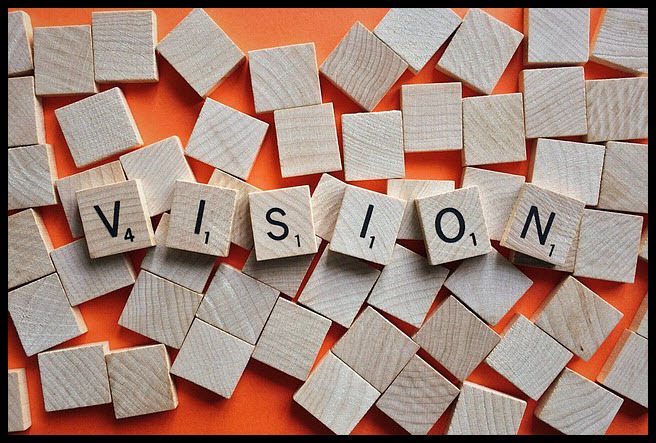 Vision Statement examples should allow the team members to stretch their expectations, aspirations, and performance. One also gets much more mileage and buy-in with the Vision Statement examples when wordsmithed in a group (the team) setting. Also, one can accomplish the end objective much more quickly when you start with vision statement examples generated by our free Vision Statement Examples Creator spreadsheet. You can download this by signing up for our free QA solutions E-zine (above). When published after group input, the vision is shared, and those who participated feel personal ownership of the Vision Statement. How do we want the business to look 5+ years from now? That picture should be different from today’s picture in several ways. Think about products, services, facilities, the targeted market, customer satisfaction, etc. Is it the right direction? What is missing, if anything? Does it inspire your support and commitment? Does it create an emotional and motivational response? (The entire team needs to be able to identify with it and use it to make decisions and focus their energies). Is it easily understood and can it be sufficiently absorbed by an individual to cause action? (Vision Statement examples needs to connect to the daily business lives of employees). One will need to be prepared to set specific goals, and take action, in order to make progress toward achieving the vision. What opportunities do we have that we aren’t taking advantage of? What would we do if we had more time and resources? What do we want to be known for in the business community? Perception or reality? What are our corporate culture, strategies, values, and vision of the future? Inspire - Vision Statements need to connect with people at both the intellectual and the emotional level. Be clear and vivid - If one can see it or vividly picture it in their mind, one has a much better chance of achieving it. Describe a better future - People connect personally when they can see that the future holds something desirable that doesn’t currently exist. Any business formation starts from a thought, a dream, an idea, or a passion. In creating a business, we refer this conception as the Business Vision. As a vision, it is intangible, and the leaders drive the initiatives that make it a tangible reality. So the vision must be defined, documented, and communicated. The Vision Statement focuses the beam of light that provides clarity for all other business activities and decisions. Without a vision of where one wants the business to go, how would one ever get it there? First, do some brainstorming. Nothing should be considered off limits/sacred – all thoughts and ideas should be captured in detail and eventually reviewed in depth for merit. Call upon one’s personal passion, which motivated them to begin the business in the first place. See the vision in your mind first, and then create a picture in words that describes your vision. This is the first step toward making it a reality. Approach respected colleagues, associates, or employees whose judgment and insight to see how they view the business and what potential they see. One may get some good ideas that would expand upon one’s original thoughts. Of course, ultimately the vision has to be yours. Look for what makes you feel excited and for what creates a strong desire to proceed. Publish it and communicate it. Review it with your staff and/or team to gain consensus and buy-in, then publish and communicate it. The value of doing it this way lets you share the vision and those who participated feel personal ownership of the Vision Statement - everyone owns the result. As a downside, you may not like the consensus process or the end result. As you make decisions on a daily basis, use your Vision Statement as a point of reference. Then choose the decision that most closely supports your vision. That’s the real value of the vision – to keep you focused on where you want to go. It’s also the foundation for developing the Mission Statement and the Operational Business Model. To be the worlds best services company and to be recognized as the best. To be recognized by our customers as their best supplier. To be the number one supplier of components to the automotive industry, globally. To be recognized by our customers as the areas best Dental Practice. To have our Catering Company grow to be the areas largest through excellent and abundant customer referral. To be the recognized global leader in our field in the digital economy. To be a market leader that creates enduring customer relationships through second to none operational excellence, and second to none innovative products and services. Penetrate the global marketplace and win the lion’s share of our business through abundant and ongoing, excellent customer referral. Provide the dominant global wireless network, and develop future capabilities to retain top position. We will recruit, engage, and retain the best people in the industry; deliver recognizable value for every dollar spent; and create a business environment focused on teamwork and operational excellence. Provide a computer information security consulting and services business sustained by increasing customer revenues and successful commercial ventures.